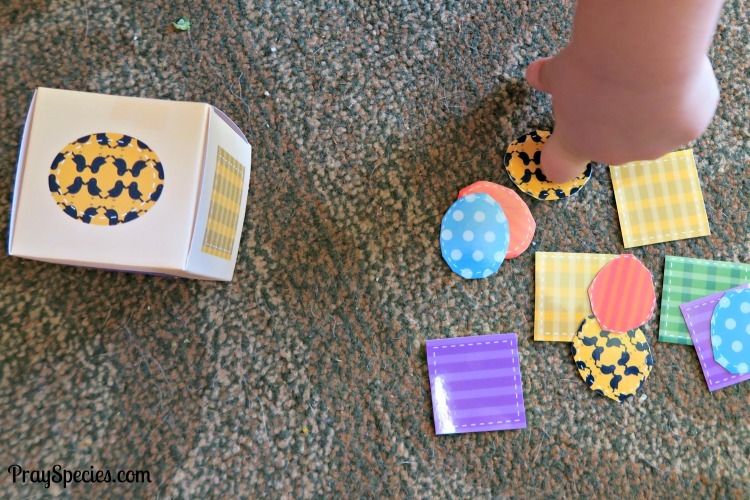 My kids are huge fans of the celebration kits that are included with our monthly themed preschool curriculum from Mother Goose Time. This month, the focus is on the Pumpkin Patch. 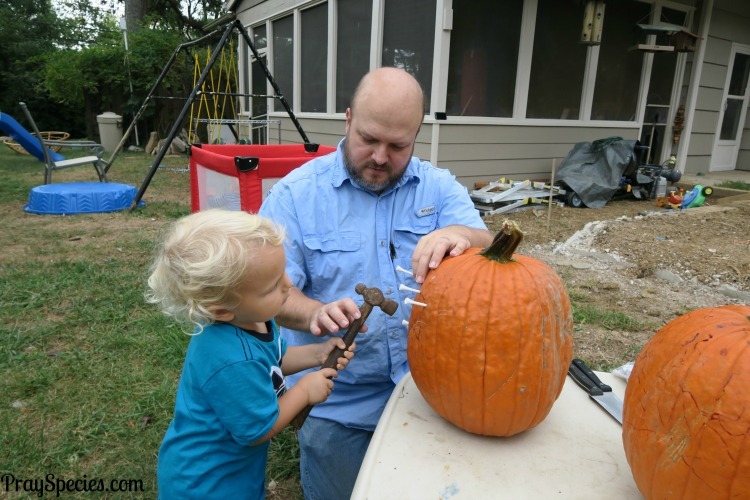 Since this year, we grew our own pumpkin in the backyard, the kids were extremely interested in learning more about pumpkins and diving into these pumpkin and fall themed activities and adventures. The ideas in this kit were a big hit with my kiddos and I’m happy to be able to share them with you. 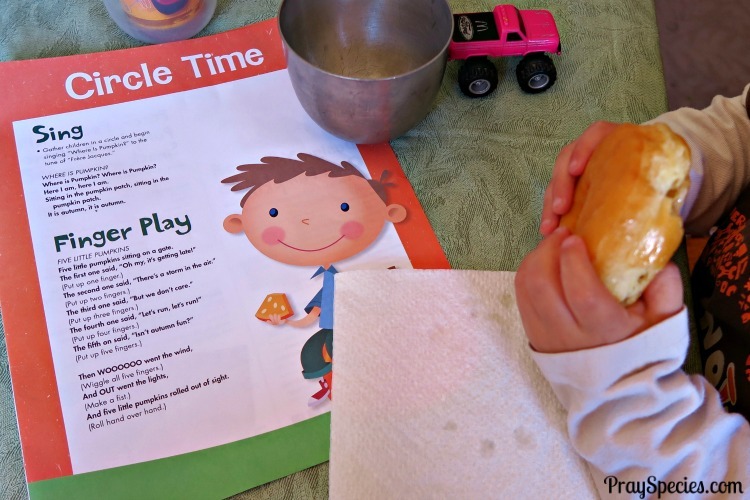 We started our pumpkin celebration with this simple song and finger play! Where is pumpkin? Where is pumpkin? Sitting in the pumpkin patch, sitting in the pumpkin patch. It is autumn, it is autumn. 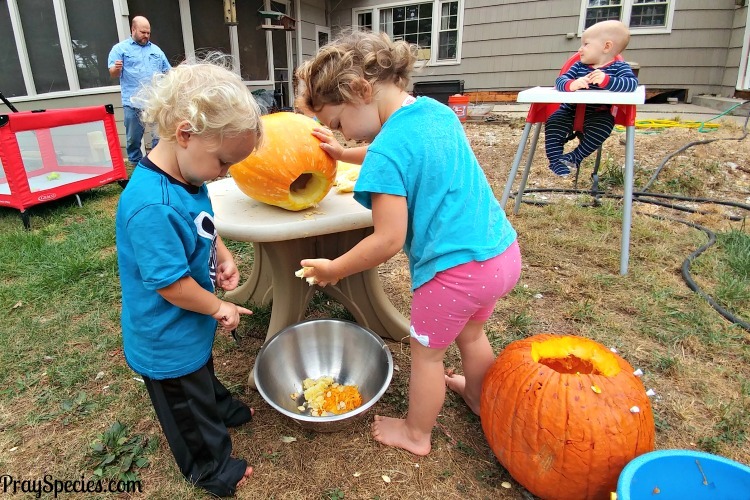 We explored a real pumpkin in the backyard and found all the parts: the stem, outside shell, flesh, pulp, and seeds. Yes, this is the pumpkin we grew in our own backyard! 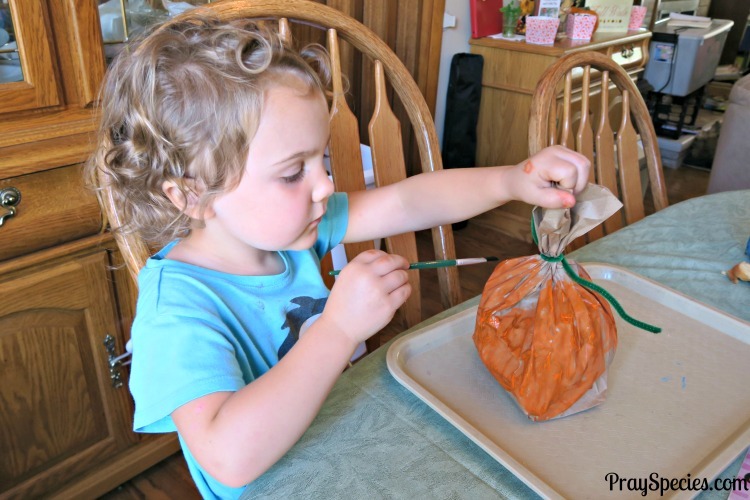 Then, we created our own little craft pumpkins. Using old magazines, we stuffed small lunch paper bags and tied the top with a green pipe cleaner. We painted the bottom orange, except for Owl who requested a blue pumpkin 🙂 Then, we cut out shapes from black construction paper and used them to make a face on our pumpkins. 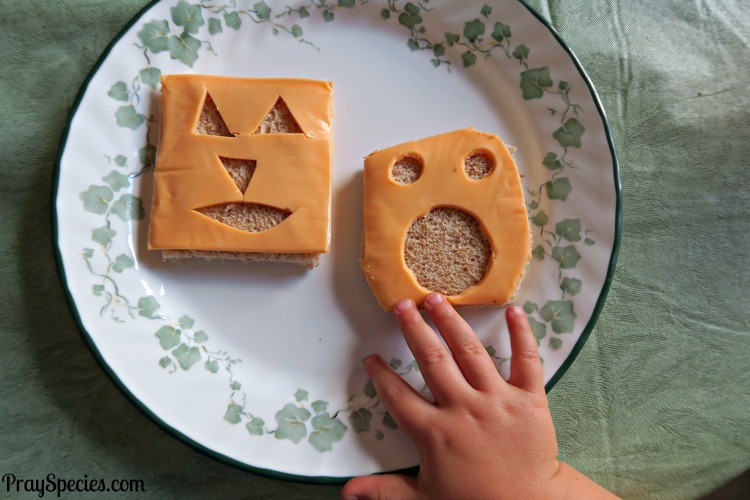 We took a snack break and enjoyed some bread with cheese slices with faces cut into them. We dressed up as scarecrows. 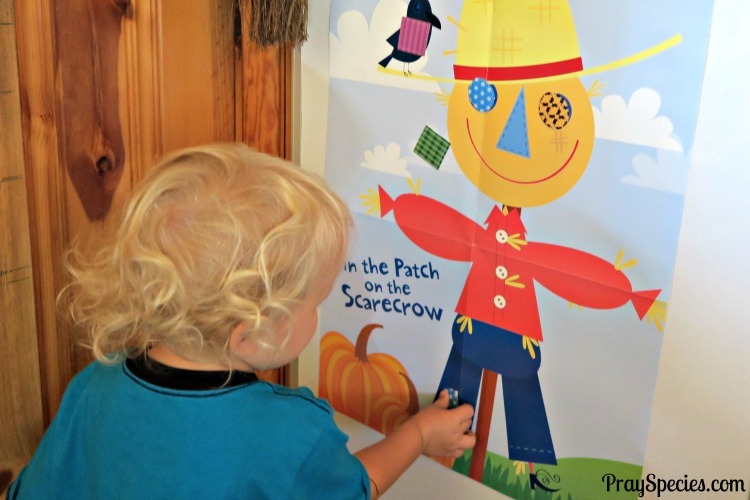 Ladybug was a “Lady Scarecrow” complete in “super fancy dress.” Her words, not mine 🙂 We rolled a dice that had patterns that matched different “patches” that the kids were then able to “pin” (we used masking tape) to the scarecrow. 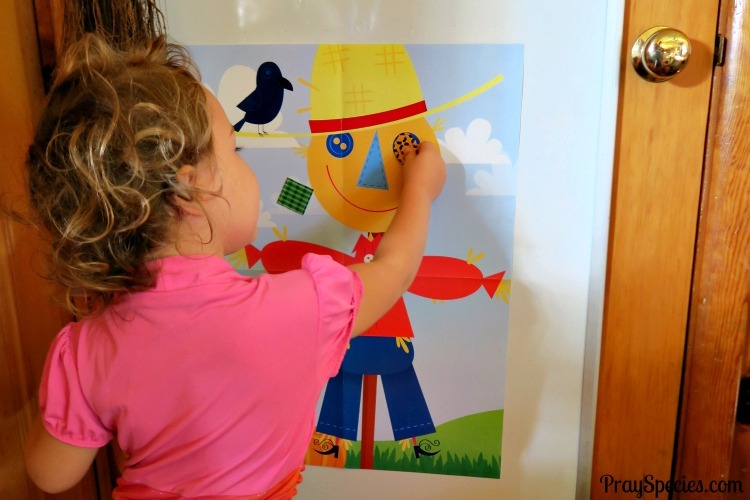 Both kids preferred aiming for the scarecrow’s face instead of his pants. 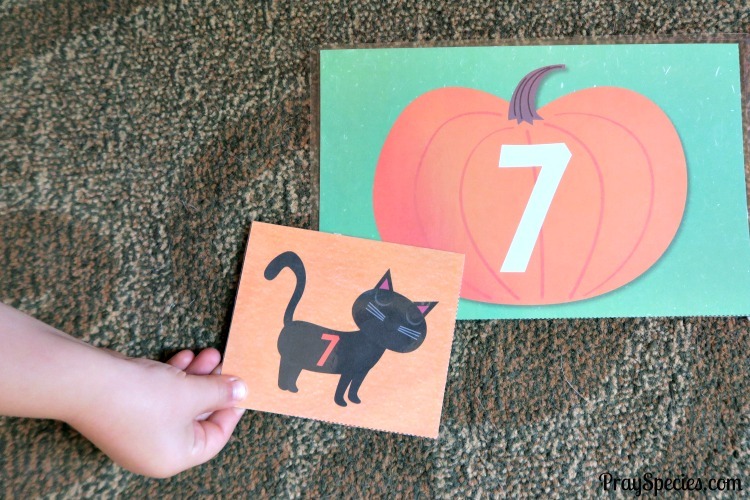 We had some fun counting and matching numbers on cats and pumpkins, while trying to avoid picking the card with the bat. Ladybug did an amazing job of matching up numbers on cats and pumpkins. 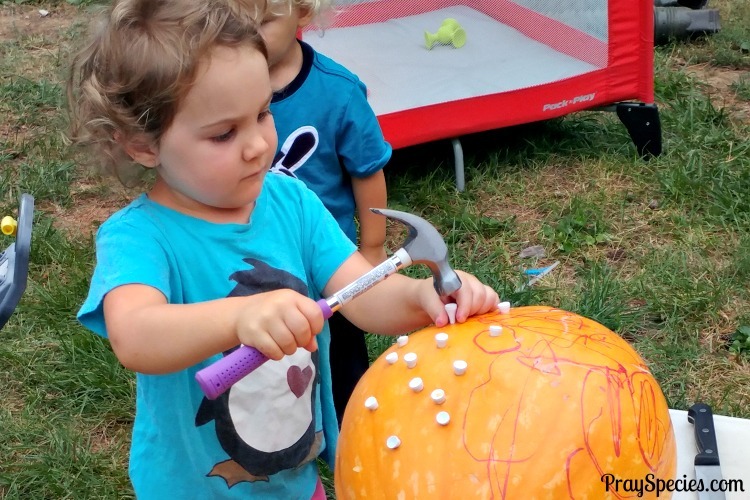 The kids enjoyed designing their own pumpkin and helping to carve it by using golf tees and a child friendly hammer. We had a lot of success having the kids first draw or describe what shapes they wanted the pumpkins to have for eyes, nose, and mouth. Then, the kids followed that design and hammered in the golf tees along the drawn lines. Then, the adults came behind and cut out those shapes. Ladybug at four was able to do this activity all on her own. Owl at two and half years old needed some assistance, which Daddy was happy to supply. 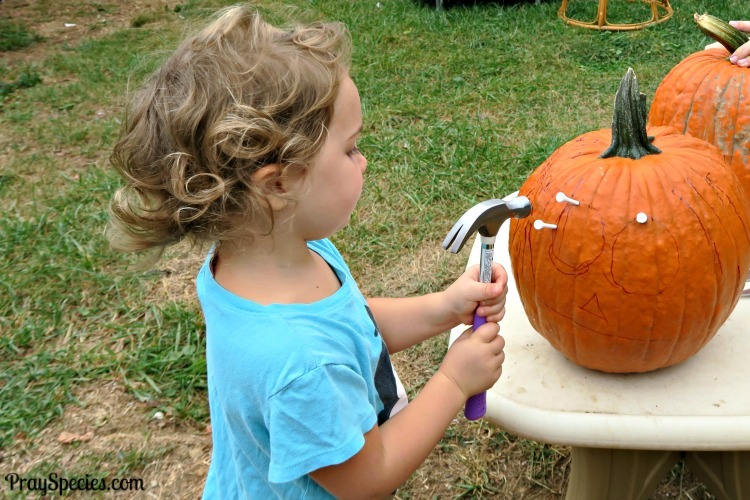 Ladybug was adamant that she wanted to carve the pumpkin she grew in the backyard all by herself, so we tried letting her put as many holes in the pumpkin as she could using the golf tees. Alas, when we tried to light the pumpkin with a candle, there wasn’t enough room for oxygen to get to the flame and it quickly died. Ladybug loves her pumpkin anyway, so we left it exactly as she did. We also hid a few pumpkin seeds in dirt for my little nature detectives to find. I gave Ladybug a set of tweezers to pull them out and Owl was given a spoon. 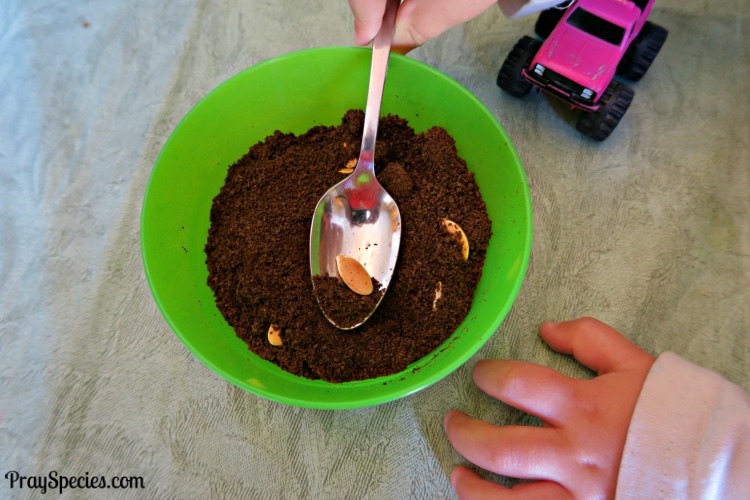 We used dried coffee grounds for dirt. 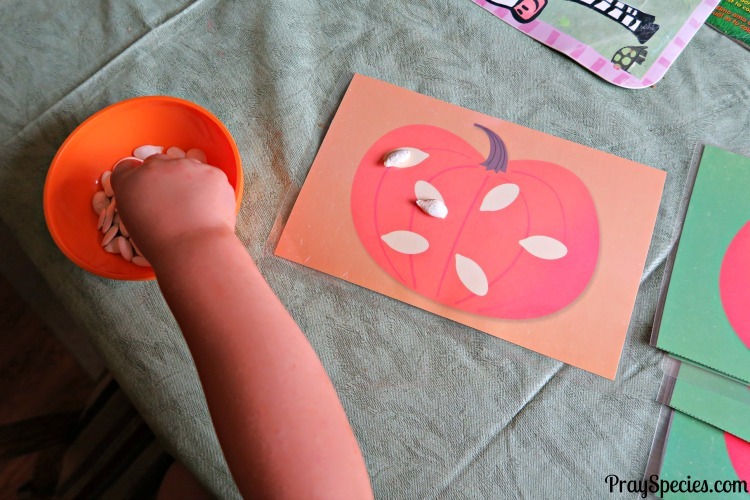 We then placed the seeds onto the pumpkin counting cards. This was great practice for Owl who is still learning to appreciate “how much” is meant by number names. They also enjoyed eating the salted pumpkin seeds we used! 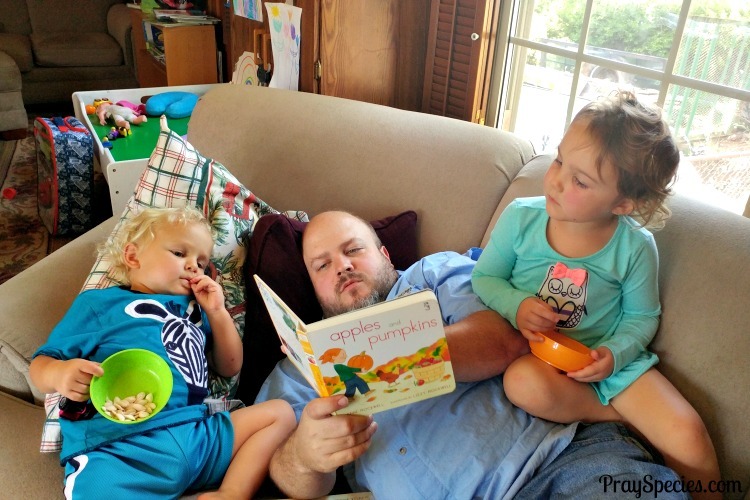 As always we read a ton of fall themed books to round out our pumpkin celebration. Here are just a few of our favorites we enjoyed while munching on pumpkin seeds! Do you have a favorite pumpkin themed book to share?